Indulge in an overnight stay in the Yarra Valley - Australian Wine Tour Co. So wrote Robert Louis Stevenson, who certainly knew a thing or two about getting away from it all. But you don’t have to sail to a treasure island to experience romance, exotic food and fine wine. You’ll find all these and more in the Yarra Valley, just an hour by road from Melbourne. Of course you could just make your own way there – but if you want to be sure to catch all the highlights of the Yarra Valley’s wine and food culture, a 2 day Winery Tour from Australian Wine Tour Co. makes much more sense. 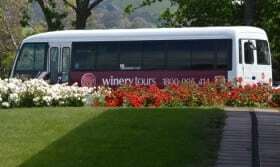 You’ll be picked up on the morning of Day 1 from one of the 5 designated assembly points in and around the Melbourne CBD, in one of Australian Wine Tour Co.’s luxurious buses. AWTC makes a point of using smallish vehicles, seating a maximum of 24 people, because they want to maintain the intimacy and sociability of their tours. So you’re likely to find yourself in a group of around 15 like-minded people. 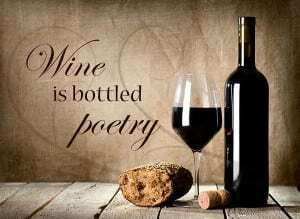 Plus, of course, AWTC’s Wine Expert, who will take the opportunity of the drive to the Valley to entertain and educate you about the wines you are going to experience in the next 30 hours. Fir st order of the day is a visit to Yering Station. At the cellar door you’ll get a quick tutorial on the “three esses” of wine tasting – Swirl, Sniff, Slurp before diving into the product of this renowned Yarra Valley winery. After paying your respects – gently – to Bacchus at Yering Station, you’ll find that it’s nearly time for a spot of lunch, and you’ll move on to Balgownie Estate – your lunch venue, and also the Resort where you’ll stay the night. The Balgownie Estate Resort and Spa is really something. It boasts 4.5 stars, and with its luxurious rooms and amenities and spectacular views, it deserves every one of them. But first, lunch! You’ll be greeted by the cellar door staff who will test your newly acquired slurping skills on their great wines, before moving to Rae’s Restaurant for a delicious lunch accompanied by a glass of Balgownie estate’s finest. After lunch, it’s time to check in to your Spa Suite. That means saying au revoir to your tour companions. 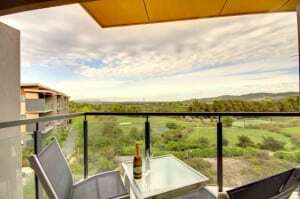 The Spa Suites are spacious, beautifully appointed and sport a balcony with a million dollar Yarra Valley view. From then on, your time is your own, although pool, steam room and gym, to say nothing of fine wine and food, are never far away. There’s even a 1.6km walking trail to help you build up an appetite for dinner, which you can enjoy either in the privacy of your room or in Rae’s Restaurant. The following morning is “free”, allowing you to explore the Resort fully. 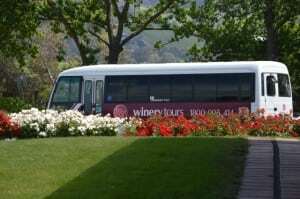 Then at 1.15pm you’ll board the bus again and visit Yering Farm, a prime example of “preserved” Yarra Valley rusticity. 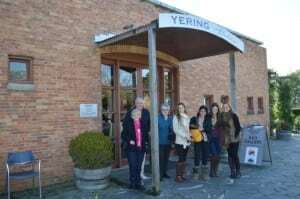 After sampling Yering Farm’s finest, you’ll be taken to the last stop of your tour. This is something a little different – French champagne company Moet et Chandon offer a guided tour of their Yarra Valley production house, Domain Chandon, finished with a glass of the product accompanied by delicacies. The AWTC bus will get you back to the real world – that’s Melbourne to you – by about 5pm. But to tell the truth, you’ll feel your break has been a lot longer! Australian Wine Tour Co.’s Overnight Stay costs $395 per person, and you can book here.